Noreva Actipur Anti-Imperfections Care corrects the localized imperfections of acne-prone skin. 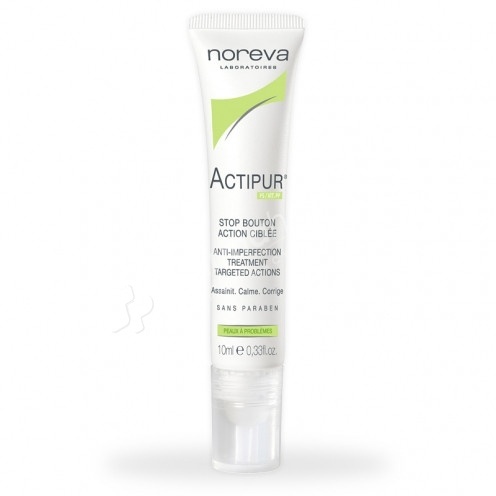 Noreva Actipur Stop Action Button Targeted 10ml dries and corrects quickly and durably the localized imperfections of acne-prone skin, and calms the inflamed areas. This treatment limits bacterial growth, neutralizes irritating factors and cleanses the skin thanks to vitamin PP. Formulated without AHA, this treatment can be used in summer without risk of photosensitization. Non-comedogenic, non-photosensitizing, no perfume, no preservatives, no aha, no paraben. Apply 2 to 3 times a day on the affected area.